I wanted for a while to build a replica of the Lunar Roving Vehicle, I have tried many time with big scale, small scale, remoted or not, with the folding deployment system or not. And now I figure out to build a small scaling replica of the LRV. Features drives and steering connected to a joystick, many details and a deployment system. The LRV is powered by a L motor connected to two axle with no central differential as the both axle steer. There are a differential on each axle but no suspension due to the scale. The steering is operated by a servo motor located in the chassis and operates both axle for a result of a small turning radius. There is also a ackermann steering geometry enable a better turning abilities. There are many details on-board, including seats, high and low gain antenna, cameras, tool carrier, dashboard computer and solar panel. But the important thing here is the integration of the mechanical components. As you can see, the motor is located with the IR receiver in the central frame, and the battery box located on the bottom. It was very important because of the respect of the original design and also for enabling the deployment system. By folding the seat, bend the antenna, camera and dashboard, the axles can be unlocked by removing the blue axle pins, then, the LRV can be folded as its landing configuration as real (ok still an approximation, in real, wheels are taken apart). Of course it doesn’t need to remove mechanical parts. The steering passes through a U-join which enables the articulation, and a quick 3 pins coupling as shown on the next picture enable the connecting of the drive. To finish, I would like to reproduce the principle of command of this vehicle, using a joystick. Of course in real LRV the joystick is on-board but I have made it outboard in order to remote the lego replica. 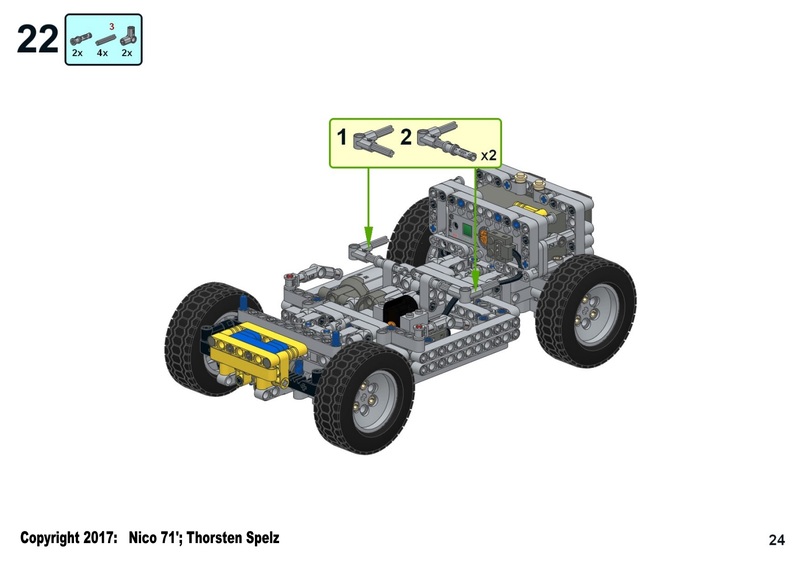 It is based on the IR remote lego, using linkage to decompose the two actions : drives and steering (functioning shown in the video). To conclude, I am a big fan of space and exploration, therefore I am satisfied of this moc, it was not the most complex I have done, but have some interesting points. First the compact building of the chassis which carries the whole drive train with motors, then the folding system with coupling, the design with details and then the joystick which is very fun and handy to drive ! I have also tried to add a graphic touch in the picture to make thinking about lunar environment. But I did not manage to do the same thing with the videos because of the high noise in low light condition. I have made the photo sequence instructions then Thorsten Speltz has made the rendered instructions, many thanks to him ! Therefore I can propose you two instructions, one for free and one for sale. As usual, you can buy it for 10€ and then download the instruction immediately. 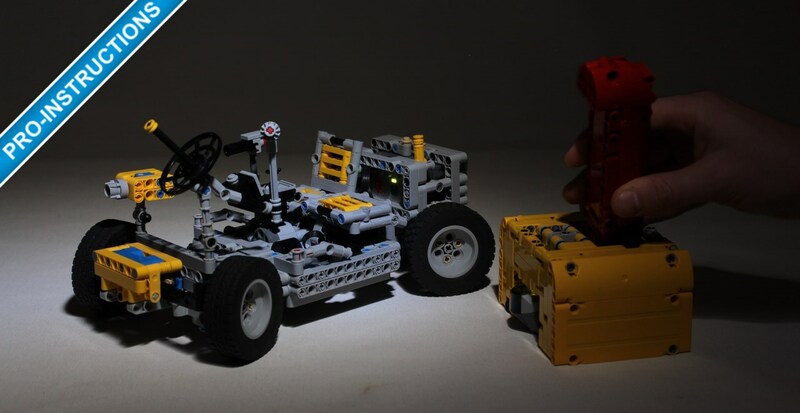 Want to know if you can build the Lunar Rover ? 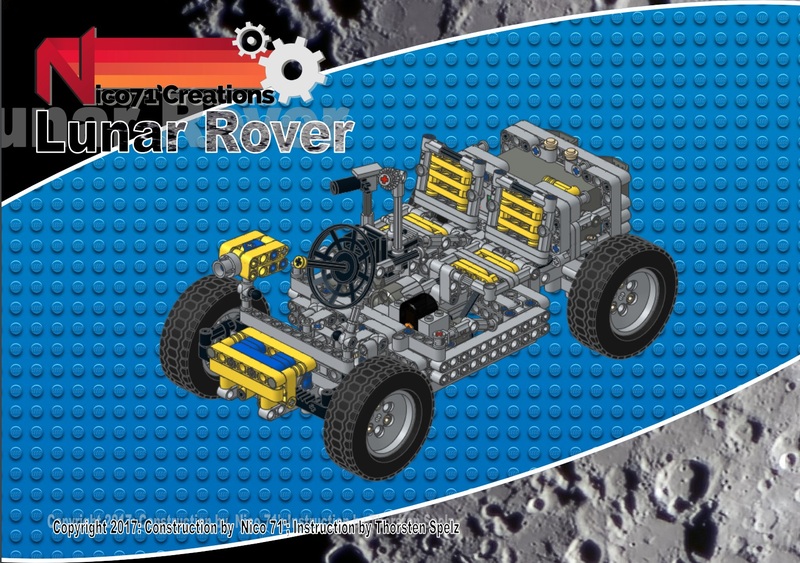 The Lunar Rover has been indexed to rebrickable, check it ! By using the next up paypal button, you will get the pro-building instruction in PDF for 10€. Here is the instructions as a dismantling photo sequence (watch it in reverse way). Great build, not only I love the lunar rover but I also think it’s awesome the way you were able to find a way to fold the chassis and replicate the AWD feature. I’m looking forward for the instructions!